These are uncertain times. In uncertain times, we look for constants – and we are finding them in the ancient themes of mythology. For evidence, says University of New England expert in children’s literature, Dr Elizabeth Hale, consider the mythological themes saturating today’s popular culture. Hollywood’s latest superhero blockbuster, Wonder Woman, has as its central character “Diana of Themyscira”. Bodybuilders attempt to change their mortal bodies into imagined likenesses of the god-sired Hercules. Gamers reprise the battle for Troy all over again. This irruption of ancient themes into our supposedly rational age is the subject of “Our Mythical Childhood,” a 1.49 million Euro multi-nation research project awarded by the European Research Council to a group of researchers, including Dr Hale. 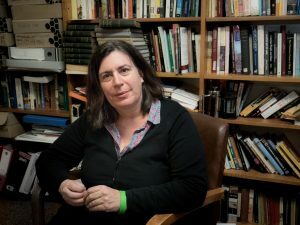 Dr Elizabeth Hale, Senior Lecturer in English and Writing at the University of New England’s School of Arts. Led by Professor Katarzyna Marciniak of the University of Warsaw’s Faculty of Artes Liberales, the project brings together researchers from Australia, Poland, the United Kingdom, Israel, and Cameroon in an inquiry into why the foundational stories of the ancient Greco-Roman world have such a potent presence in today’s culture. “As a collective, we are investigating how children’s culture around the world is inspired by classical antiquity, especially its mythology, and how it is transmitting those myths,” Dr Hale says. Australian author Sulari Gentill has written a trilogy in which a group of teenagers accompanies Odysseus on his roamings—and find the great hero more vainglorious than glorious. American author Rick Riordan’s “Percy Jackson” series has as its hero a modern teen who also happens to be a Greek demigod pursuing the plotlines of ancient mythology in contemporary times. In the Argentinian indie game, Okhlos, players control a ‘mob’ to overcome despotic gods and fight for humanity. Dr Hale’s belief is that myths serve the same purpose now as they did in the violent centuries of Mediterranean antiquity: they present the issues arising from life’s turbulence more satisfactorily than a confused reality. A similar phenomenon occurred in the tumultuous years of the French Revolution, which gave rise to the Gothic imagination. Especially for teenagers, she thinks, the mythological tension between humans and gods has echoes of the teen’s perspective on the world, when they have ideas about their own emerging powers but are constrained by the apparently arbitrary rules set by parents and society. “’Our Mythical Childhood’ promises to be a very exciting endeavour, uniting the best of traditional arts and humanities research with cutting edge digital scholarship, and a real-world application to the education of young people around the world,” Dr Hale said. Dr Hale has just returned from Poland, where she gave a series of talks about Australian and New Zealand children’s literature at the Universities of Warsaw and Wroclaw and began working with the ERC-funded team on the project’s foundations. That includes the setting up of an open-access database that will collect examples of where antiquity and modernity meet, and establishing a framework for interpreting the material. Dr Hale has received an individual budget of 159,000 Euros to oversee the gathering of the extensive Australian and Asia-Pacific data, and to write a guide to children’s literature inspired by classical antiquity. You can email Liz at ehale@une.edu.au.